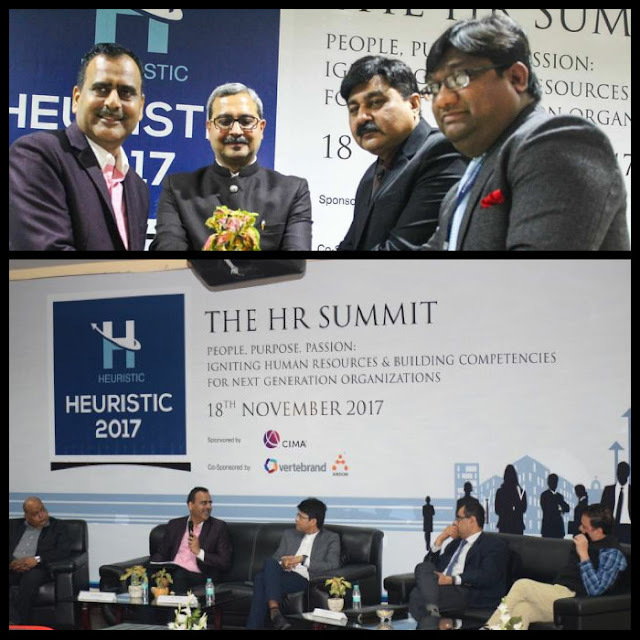 HRsuccessmantra: Heuristic 2017 HR Summit - "People, Purpose, Passion : Igniting Human Resources & building competencies for next generation organisations"
Heuristic 2017 HR Summit - "People, Purpose, Passion : Igniting Human Resources & building competencies for next generation organisations"
It was indeed a privilege to attend and give inaugural speech and chair the Panel discussion - Driving Innovation through New HR Paradigm during Heuristic 2017 HR Summit titled as "People, Purpose, Passion : Igniting Human Resources & building competencies for next generation organisations" as a central theme held on 18th November' 2017 at GD Goenka University premises. The summit was organised with an objective to discuss and debate on managing new generation workforce, embracing digital technology and adapting to fast changing regulatory environment. During the conference, leading HR experts across multiple sectors, academicians from leading educational institutions and stalwards from multiple domains participated in deliberating during the plenary session and panel discussions on themes including , Driving innovation through new HR paradigm, Leaders Insights : Imagining the next generation organisation and Winds of Change amongst others. Prof Dr Arun Sachar, Head School of Management, GD Goenka University aptly put it during the inaugural speech that HR priorities have changed from complying to legislations and looking backwards to using sophisticated technologies to derive to a strategic decisions, building competencies and developing future leaders. From reducing turnover to attracting talent through employer branding activities. “The DNA of a strategic HR function is based on the interweaving threads of understanding people and understanding work”.